Mapa Mundi, 2015. sơn mài Việt trên bảng gỗ thiết lập trong triển lãm nhóm Sous la Lune. Sotto in Sù, or “from below, upward”, is a type of European mural painting that employs different optical effects to create openings in walls through architectural illusion. In this work I use Vietnamese lacquer painting in the format of a ceiling mural to create the illusion of deep space. Instead of opening up to a trompe l’oeil sky as in Baroque frescoes, this painting opens up to a view of the world in 2015 and the limits of our sky. The ceiling fresco is to be viewed “from below looking upwards”, similar to how we look up at the night sky to see cosmos, but rather what we see is its mirror image looking down from outer space. Only recently through satellite imagery have we acquired this type of super sight, a remote representation of a seemingly accurate view of the ground below. In this painting, I take a static satellite imagery of this corner of the planet to create a Mapa Mundi with a local medium. 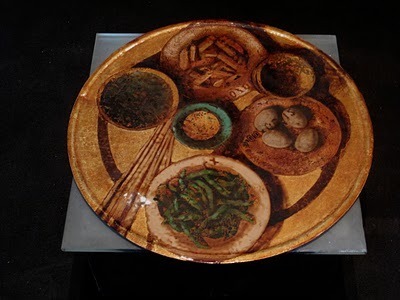 The use of Vietnamese lacquer is relevant because as an ancient medium, it was re-invented as a painting medium during the 20th century. I am interested in exploring a contemporary lexicon for this medium and how the material qualities of this medium confronts ubiquitous digital imagery surrounding us. The deep colors and and ever-changing light on a lacquer image demands a different kind of attention and offers a heightened experience of visuality. Two sets of parallel slogan paintings interpreting classic poems. 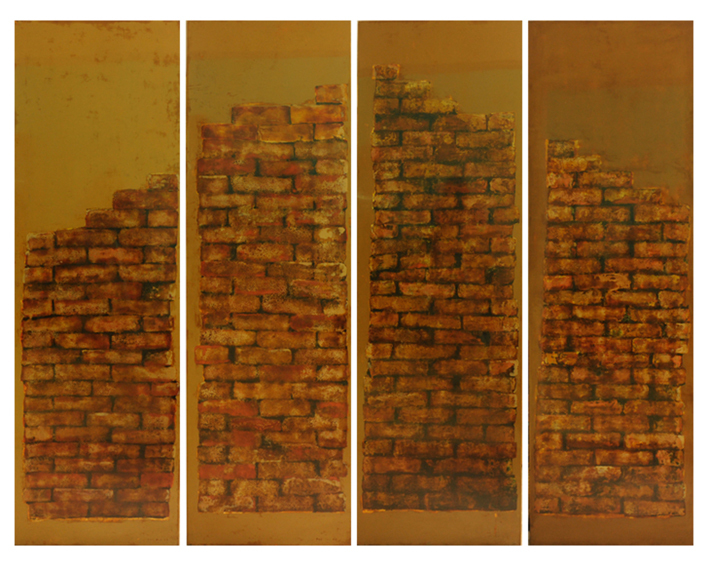 Four column paintings, 217x55cm/each, Son ta lacquer on Dau wood, Hanoi 2015. Armor Piece, Son ta lacquer on epoxy composite reinforced with carbon fiber, sculptural painting, created in 2013. Photo from A Woman's View group show, at the Goethe Institute, Hanoi, March 2014. An offshoot of Specula, the works from this exhibit emerged from my experiments in new surfaces to create Specula's curved ceiling. Make Shift includes my experiments using Vietnamese son ta heat cured onto iron and recycled metal, an old industrial Japanese lacquer technique that I adapted to natural Vietnamese lacquer. Measuring exactly three square meters in floor space, Cadastre visually graphs the housing space per capita allotted for one individual in a densely populated Asian city. Comprising of 75 (20 x 20 cm) tiles, Cadastre is a floor sculpture that employs natural lacquer (son ta) burnt onto iron to faithfully represent mass-produced ceramic floor tiles used in building construction. Inspired by the artist Carl Andres idea of emplacement and sculptural relativity, I reintroduce a narrative element to portray the time worn patterns all too familiar in old Hanoi buildings. About the work "The Great Wall"
Bricks stacks line roads and villages waiting to be used in the construction frenzy overtaking Vietnam. The Great Wall contemplates the transformation of earth into a human dwelling, and how, piece by piece, mountains and fertile land transform into cities. Relic-like, the brick stacks evoke the "glory" of ownership and the human desire to demarcate boundaries, possess territory, and exploit resources for consumption. This power left unbridled upon the fragile relationship with our surroundings is the ultimate cause of our global economic and environmental crisis. The behavior of the son ta, a natural resinous substance, parallels this idea of material transformation. Although used here to represent brick, lacquer embodies the tactility of any solid matter- texture, weight, mass-- like no other painting medium. The Great Wall examines this under-explored attribute of son ta lacquer.